I was looking for a good pumpkin cookie recipe, I found one on The Taste of Home site. My goodness this cookie is the most soft, tender cookie I've ever made. This little gem practically melts in your mouth! The Penuche Frosting fits this cookie like a glove. The frosting is made by cooking butter and brown sugar till it boils for one minute and then letting it cool for 10 minutes. After it cooled mine looked like it had firmed up on the bottom of the pan. I took it out in pieces and put it into the mixing bowl and added the milk. I let it mix until it melted beautifully into a nice tan color. I added 1 3/4 cups of powdered sugar to make a spreadable frosting to my liking. I decided to put the pecans in the recipe on top of the frosting instead of inside the batter. I thought it made a nice decoration. I pressed the pecans into the penuche lightly with my hand so they would adhere. Putting the nuts on top would be a great way to please those people that don't care for nuts and those who do. The frosting drys to make these cookies stack able or able to be packaged up. 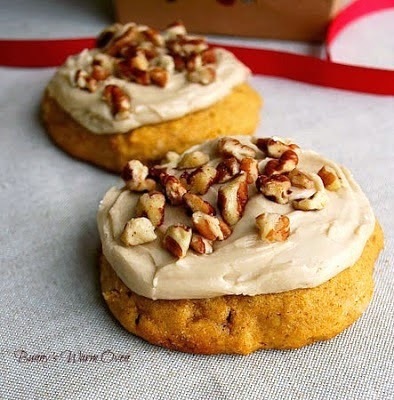 These pumpkin cookies have found a permanent place in my recipe box, they're incredible! Enjoy! In a small pan bring brown sugar and butter to a boil. Cook and stir over medium heat for 1 minute. Remove from the heat; cool 10 minutes. Transfer to large bowl; beat in milk. Beat in confectioners sugar to achieve spreading consistency. Frost cookies. Makes 5 dozen. Chelsea you'll love these cookies! Thanks for stopping by!